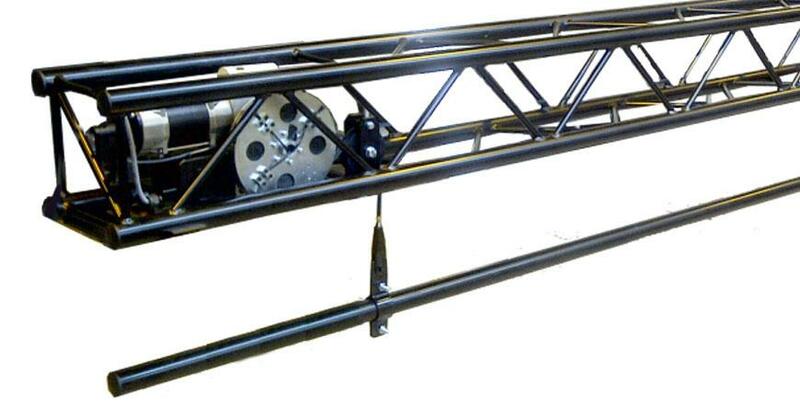 Stagecurtains.in deals in Motorized Lighting Bar, an electrical pilewind winch is mounted within the truss, along with a number of drop pulleys which allows a quick and easy method of raising and lowering lighting bars, scenery backdrops or similar suspensions. Our Light Bar are known for its durability, corrosion resistance, dimensional accuracy and elegant designs. It is perfectly suited for auditorium, theatres and school applications due to its compact and modular design. Motorised lighting bars are a complex system of chains and cables allowing lights to be suspended. The entire unit is totally motor-controlled. The hoist and gearbox are used only matching to the safety standards and the brakes all totally reliable. Considering the weight of the lights, mode of functioning, and the lighting control and operation, it remains suspended in mid-air via a plak. They are fitted into the network of grid and sky deck, become a very efficient management system, lighting system, noiseless operation, flexible gearbox, sturdy weight, bearing and easily fitting. The motion can be controlled by the crew why lowering or raising the equipment. It is always better to know the maximum load limit determined so that disasters are avoided. The motorised lighting bars are highly dynamic and resistant to most wear and tear. The Other control systems never interfere with the present lighting system and everything is easily manageable from a single console. The motorized bar allow to minimise the burden of trolleys pulleys and other heavy cable and machinery. Many of these accessories can be implanted into the wall.